Bring Gyenze’s positive energies of "increase" everywhere you go with this exclusive, tastefully designed Buddha pendant. Wear him close to your heart and be assured of the blessings of abundance, longevity and spiritual attainments. This pendant has been purified and consecrated in a Soongdrup & Rabney ritual conducted by very senior members of the monastic community held in early June 2017 at Kechara Forest Retreat. * While stocks last. * This item can also be purchased as a gift to H.E. the 25th Tsem Rinpoche. Complimentary gift card included. Bring Gyenze’s blessings everywhere you go with this exclusive, beautifully designed pendant of Gyenze mounted on a delicate square frame. Made of fine stainless steel, this pendant combines a high-end look with lasting durability and everyday wearability. 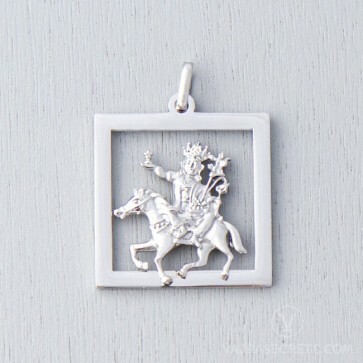 Also known as Ratna Shugden, this "increase" form of Dorje Shugden is revered by many for his ability to increase lifespan, material resources, merit, spiritual realisations, and all that is good. His image also calms the immediate environment, helps overcome life's obstacles, and grants protection from negative energies. Gyenze holds a long life vase containing the branch of a wish-granting tree in his right hand, while his left carries a bowl filled with precious jewels, symbolic of his ability to bring us material resources and abundance in all aspects. Adorned with rich yellow robes, he rides a divine palomino horse, symbolic of his ability to come to our aid swiftly. * This item can also be purchased as a gift to H.E. the 25th Tsem Rinpoche. Complimentary gift card included. * To preserve the beauty and life span of your jewellery, please read these care tips.